I was wanting to make churros again, but not the gluten free kind. 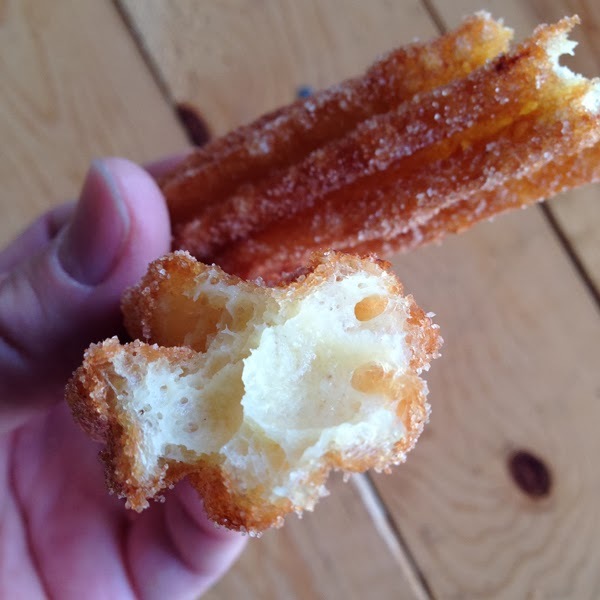 I'm still trying to make what I think is the perfect churro: crisp and slightly chewy on the outside, fluffy and almost undercooked on the inside. This recipe produced a crisp exterior and a light, fluffy, almost airy interior. I think "delicate" might be the word I'm looking for. The outside is very light as well, though, so it didn't provide the slight chew I was looking for. Maybe I need to mix it longer to develop the gluten--and maybe reduce the recipe to only one egg. I'm not sure when I'll be attempting them again, though, because seriously, I cannot keep frying up churros to blog about. It's just not wise. The original recipe at Little Inspiration calls for 1/2 cup maseca and 1/2 cup all-purpose flour. I reduced the masa flour to 1/4 cup because I was a little wary of adding a lot of corn flavor. It was a good call for me. I liked the very slight corn tortilla flavor in the background with a tiny little cornmeal bite to the churro. 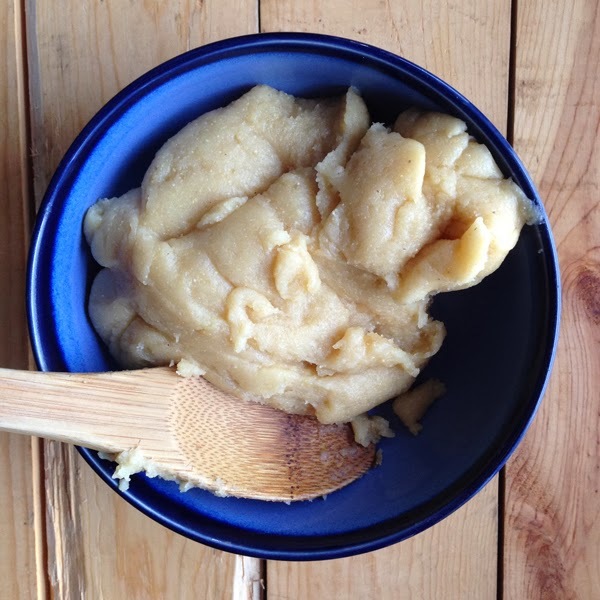 I think you could use all all-purpose flour if you don't have any masa flour on hand. 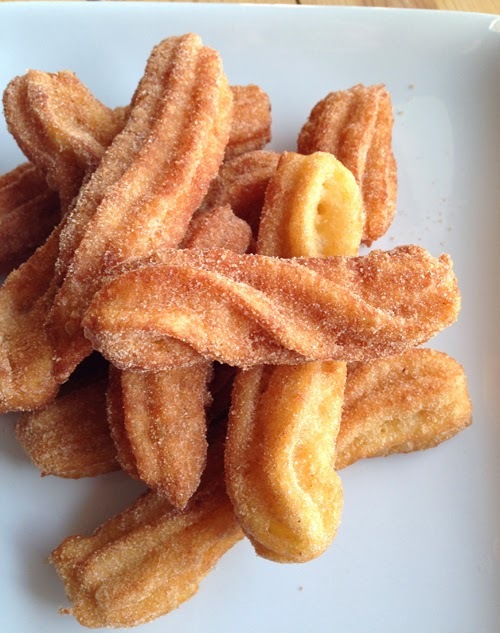 At any rate, if you're looking for a light, fluffy churro and you're not afraid of frying your food, give these a try. In a heavy bottomed medium saucepan, bring water, butter, sugar and salt to a boil. Add the vanilla extract and then the masa flour and all purpose flour. Stir until mixture comes together forming a sort of ball and pulls away from the sides of the pan. 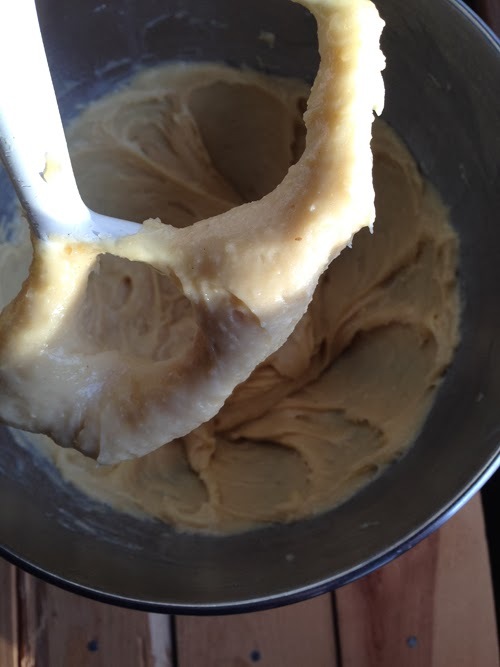 Transfer dough to a mixing bowl and allow to cool for about 10 minutes. Add eggs, one at a time, mixing thoroughly between each addition (you can use an electric mixer, a stand mixer, or a spoon). Transfer dough to the piping bag and set aside. Mix the sugar and ground cinnamon and place in a glass or metal brownie pan. Line a plate or a cooling rack with paper towels. Heat about 1 1/2 to 2 inches of canola oil to about 350 degrees Fahrenheit in a high rimmed frying pan/saute pan (anything you feel comfortable frying in). Carefully squeeze ropes about 3-5 inches in length into the oil, using a pair of kitchen shears to cut the "rope" of dough. Allow about 2 inches between ropes. My pan allowed 4-5 churros to be fried at a time. When churros are well browned on one side, use tongs to turn them over and fry on the other side until well browned as well. Remove churros with tongs to the paper towel lined plate/cooling rack. Squeeze more churros into the oil. 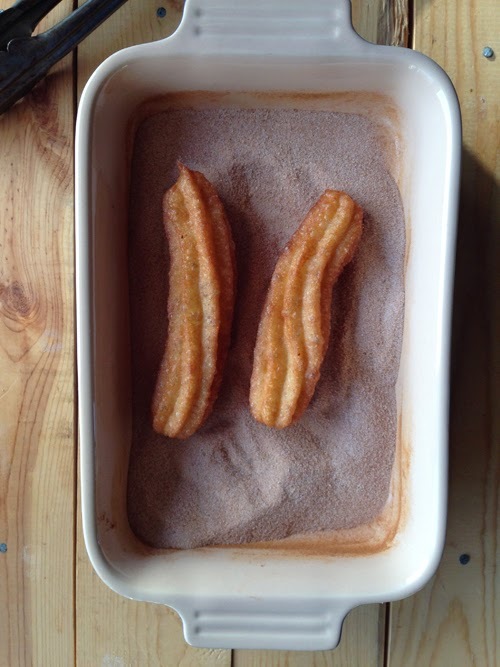 While those fry, gently toss the freshly fried churros in the cinnamon sugar mixture and then place on a serving plate or on another paper towel lined plate.